They are literally the predominate power couple in all of Tucson and Southern Arizona, but most people here know little to nothing about them. • Col. Scott Campbell, 43, is the installation commander at D-M and also commands the 355th Fighter Wing, the military unit that operates the A-10 jet aircraft at the base. He is a command pilot with more than 3,200 flight hours in various jet aircraft. Like his wife, he has flown in support of Operations Southern Watch, Enduring Freedom and Iraqi Freedom. • Col. Kim Campbell, 41, is commander of the 612th Theater Operations Group and the 474th Air Expedition Group, which provides oversight and administrative support for U.S. Air Force operations in Central America, South America and the Caribbean. She is a senior pilot with more than 1,600 hours in the A-10. How does a married couple rise through the ranks of the military to such a high level? It isn’t easy and few have done it. It takes courage, commitment, mental toughness, loyalty, patriotism, obedience and sacrifice – lots of sacrifice. The Campbells said their marriage has provided one huge career benefit: They each have access to the other’s knowledge and counsel on professional leadership and military matters. The Campbells were married Sept. 18, 1999. However, during the first five years of their marriage, with the exception of one month in 2002, the couple lived apart and saw one another for only brief periods at a time. Upon leaving the academy, Kim attended graduate school at the University of London, while Scott completed his A-10 pilot training at D-M and was assigned to Pope AFB in Fayetteville, North Carolina. After two years of long-distance dating, which included extensive old-school letter-writing and several trips across the Atlantic for both, the relationship evolved into a long-distance marriage. Days after the couple’s wedding, Scott was deployed to Kuwait and was flying missions as part of Operation Southern Watch. The Campbells were finally stationed together in January 2002 at Pope Air Force Base. But they lived together for only a month before being separated again. 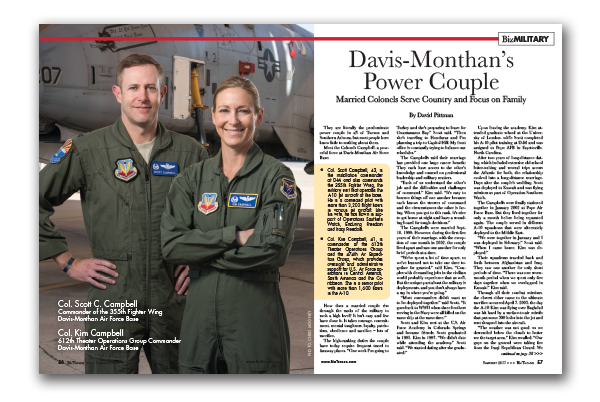 The couple served in different A-10 squadrons that were alternately deployed to the Middle East. Their squadrons traveled back and forth between Afghanistan and Iraq. They saw one another for only short periods of time. “There was one seven-month period when we spent only five days together when we overlapped in Kuwait,” Kim said. Through all their combat missions, the closest either came to the ultimate sacrifice occurred April 7, 2003, the day the A-10 Kim was flying over Baghdad was hit hard by a surface-to-air missile that put some 300 holes into the jet and sent shrapnel into the aircraft. “The weather was not good, so we descended below the clouds to better see the target area,” Kim recalled. “Our guys on the ground were taking fire from the Iraqi Republican Guard. We made a couple passes and decided to get above the weather and reassess things. I had shot some rockets and as I came off target I felt and heard a huge impact at the back of the jet. Kim emerged unscathed from the A-10 after turning it around, flying another hour and landing it in Kuwait. For her actions that day she was awarded the Distinguished Flying Cross. Finally, in 2005, the Campbells were in the same place at the same time for more than a few days. They were stationed at Nellis AFB in Las Vegas, where they lived together for three years. Scott described their time at Nellis as “the perfect setup. “I taught at the weapons school and Kim was assigned a position in the A-10 Test and Evaluations Squadron,” he said. “Neither of those units was deployable and we had a home together.” Minus deployments, which have been many, they’ve been together ever since. For a year starting in June 2008, the couple was at Fort Leavenworth in Kansas, where they attended the Army Command and General Staff College. It was there that their first child was born. The Campbells with their infant son spent three years at D-M from June 2009 to July 2012 serving as commanders of two different A-10 squadrons. “It was a challenging time,” said Scott of his stint as a single parent and new squadron commander. When the Campbells’ second child was born, the situation was reversed. The couple’s two boys are now ages 8 and 4. Both Kim and Scott said their biggest priority today is keeping their family together.